This podcast often hangs out at the intersection of art and commerce, so I was happy when Dmitry Samarov drove up in a cab with his sketchbook! * Dmitry recently published Where To? : A Hack Memoir (Curbside Splendor Press), his second book of essays and art about his experiences behind the wheel of a taxi in Chicago and Boston. We talk about the job’s intersection with his fine arts background, his compulsion to chronicle his working life in words and images, how he made the transition from ‘zine to blog to book deal, how John Hodgman helped him get his break into publishing, what it’s like to run a website built in 2004, why he fled Parsons School of Design after one semester, and how it felt to leave the cab-driving world behind. We also talk about his family’s emigration from the Soviet Union when he was a child (and his affinity for The Americans), what it was like to attend the School of the Art Institute of Chicago with Chris Ware, and why he hates Boston with the passion of a thousand burning suns. Most importantly, we find out what an appropriate tip is for a cab-ride! That’s worth the price of admission by itself! Dmitry Samarov was born in Moscow, USSR, in 1970. He emigrated to the United States with his family in 1978. He got in trouble in first grade for doodling on his Lenin Red Star pin and hasn’t stopped doodling since. After a false start at Parsons School of Design in New York, he graduated with a BFA in painting at printmaking from the School of the Art Institute of Chicago in 1993. Upon graduation he promptly began driving a cab — first in Boston, then after a time, in Chicago. He is the author of two books, Hack: Stories from a Chicago Cab , and Where To? : A Hack Memoir . You should go watch five teaser clips of the Chicago Hack series (dir. John McNaughton), which use Dmitry’s art and writing for a half-hour scripted TV series. You should also check out his paintings, and maybe buy some. Credits: This episode’s music is A Nice Piece For Orchestra by Bernard Herrmann (from the Taxi Driver soundtrack, duh). 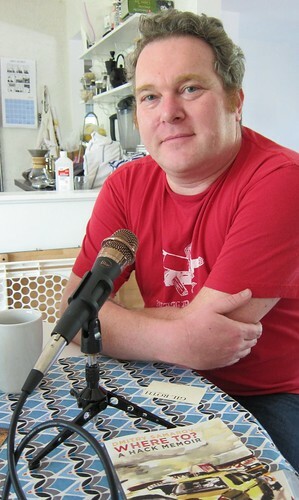 The conversation was recorded at Chez Virtual Memories on a pair of Blue enCORE 200 microphones feeding into a Zoom H5 digital recorder. The intro and outro were recorded on a Blue Yeti USB Microphone . Processing was done in Audacity and Garage Band. Photo of Mr. Samarov by me.